Whip 1 1/3 c lard until fluffy. Beat in flour and water, alternating each. Beat in melted lard. To assemble tomal: Place approximately 2 tbs of dough in the center of the tamale and flatten. Place the same amount of filling on the dough and cover with 1 tbs of dough. Fold husks over like an envelope and tie with string (the Aztecs used a piece of corn husk). Steam tamales for 1 hour or until dough pulls away from the husk. Large corn tortillas Cook turkey, vegetables, broth and seasonings in a sauce pan until the vegetables are tender. Wrap a few tablespoons of filling into each tortilla and serve. Chop all ingredients very fine, especially the hot peppers. Simmer over low flame until reduced and thick. Finely chop all ingredients and serve fresh. Mix together and beat for several seconds in an electric blender or by hand. Serve in small cups. (The honey and vanilla can be omitted and chili powder can be added. )* I use Natural Cocoa Powder from Penzy’s Spice. It is not Dutch processed and still retains all of the fat found in the bean. Corn as you well know is our "Manna" from the sky. MAIZE as it is called. 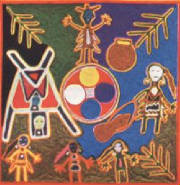 This is a Huichol myth about the origins of maize. From CORN comes many foods. It seems to have a Spiritual uplifting. When the Israelites were told to get out of Egypt and went wondering into the wilderness with Moses, they almost starved. But God sent them "MANNA" and they ate it. CORN is the "MANNA" of the Indigenous Peoples also. This legend talks about the influence of the molecules that give its characteristic color to maize grains) in maize selection. When it's said that the Mother of Maize finds a huichol young man, takes him to her home, offers him in marriage her daughters where each one of them represents a color, it's indicating the main colors of maize grains from where the selection will be perfromed, thus she has a White Daughter, another Red, one Yellow, a Spotted and a Blue one, the huichol chooses the Girl of Blue Maize who is the most beautiful and most sacred. Now this concludes the CORN Legend of the Huichol People, descendants of the Proud Lords of the Aztec People ( Mecheekahs ).